Denmark is beautiful. Jaw-droppingly, awe-inspiringly beautiful. As I’ve gone about my business by foot or bike for the past week, I’ve just been continually amazed at the scenery – woodlands of karri, marri and jarrah, the gorgeous but greedy Denmark River that invades the river banks and steals footpaths, wetlands everywhere, the serene Wilson Inlet, the invigorating Ocean Beach, even the man made landscapes are gorgeous like the riverside garden by the bridge and the hospital grounds. Then there’s the wildlife – creaky frogs with every step it seems, kangaroos invading the caravan park at night, pelicans and ducks and gulls, an odd looking marsupial that scampered out of the campers kitchen last night as I entered! (looked like a small quokka). The whole place is utterly captivating and an absolute pleasure to experience. But thats not why I came here. I came to investigate how there came to be a fairly major road, running alongside the river from the town centre to the inlet, by the name of Hollings Road – intriguing! My interest in my family history has been renewed recently after sadly finding out a lot of stories about my Nanna’s life and her parents only in preparing for her funeral – not too uncommon I’d imagine. What I was most struck by is how much like her I am, in so many ways – something that sadly I wasn’t consciously aware of while she was alive. So I’ve resolved to research, talk to other relatives while I still can and record as much as possible – both to preserve for future generations but also to try to piece together the collective history that has shaped me. I already had a start on this from having followed up Grandpa Hollings’ family history whilst I was living in the neighbouring county to where he was born in England. It’s time to continue and I was certainly curious discover what link my family branch has with the Denmark crew – if any. A fairly basic search in the local history section of the Denmark Library uncovered a Tom Lodge Hollings, who was Chairman of the Roads Board here in 1941-43 and remained on the Board until 1946. Sounds like an ideal candidate to name a road after I thought! I also discovered that his daughter Betty was still alive – or at least had been a couple of years ago. But not a great deal more info than that was available at the library. I was recommended to contact the President of the local Historical Society Bev McGuinness who was incredibly helpful and found whatever additional information she could in their very excellent records there. The Society clearly has a lot of dedicated volunteers. Bev told me about a group of ladies who used to regularly picnic in the local cemetery, systematically recording all the details of every gravestone while they were at it and adding any anecdotal info that would help to fill in the picture. What a fantastic resource! In regards the Hollings family, I discovered Tom’s birthdate and place, that he had two wives, two children by his first wife and apparently none by his second, and that his son George had died during a flight training exercise in England in 1944 during WWII. Tom himself died the year I was born – 1973. Thus the Hollings name line has died out in Denmark. However Tom’s daughter Betty Mumford is still alive and I was fortunate enough to meet and talk with her briefly at the Blue Wren Nursing Home at the hospital. She didn’t know anything about her Dad’s parents unfortunately, but did tell me that he had come out to Australia as a young adult, prior to WWI. He landed in Albany where he first found work as a carpenter working on the flood gates in Torbay, then a large family home also in Torbay. He met Louisa May, his first wife, in Albany and they married there and had Betty and George in tow by the time they moved to Denmark to run an orchard (Betty was 11). Betty stressed that her Dad knew nothing about orchard work – but that he learned all the skills required from scratch and appears to have built a fairly successful enterprise. She was clearly very proud of his achievements in that area. 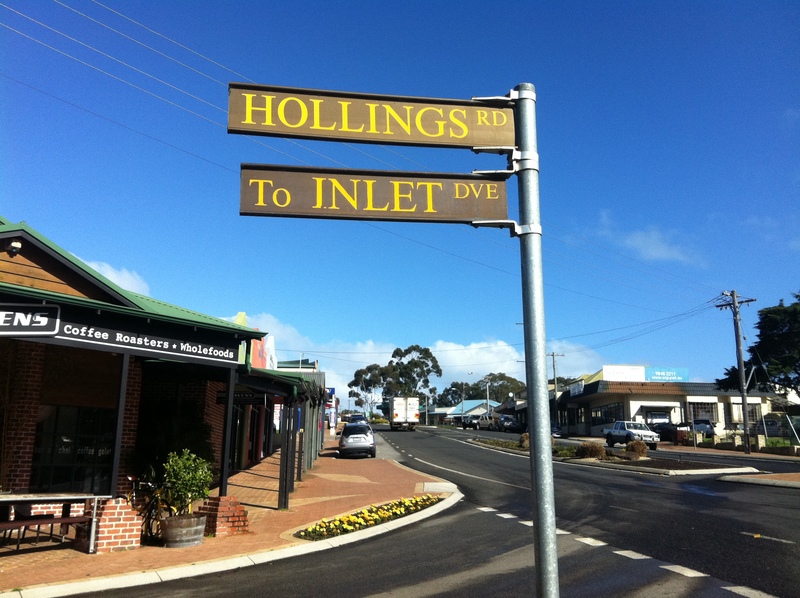 As for Hollings Road – Bev believes it was actually named after George Hollings after he died in WWII, rather than after his dad. Bev has researched and published a book about all of the men of Denmark whose sacrifice for their country is recorded on the local memorial – there is a reasonably entry on George, including a beautiful letter he sent to his niece and nephew from the from line. A real treasure. So it’s farewell to beautiful Denmark for now. Universe is talking as I had a drop in at MWDC just yesterday and when I recieved the call from Emma stating that an Anne Duncan was at reception to see me I was a little mystified as I had no recollection of the name – turns out we are related 3 rd cousins and Anne is collecting the history of my mums lineage in connection to her family the Clark’s – wierd huh. So can fully understand this sense of need to ensure history and lineage etc is not lost but gained. Rock on and great to hear your news mate. Hope Sweetie is travelling well.